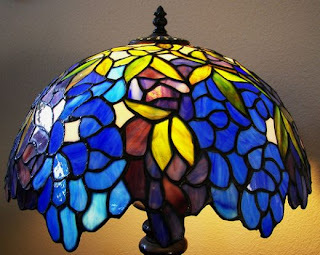 Exhibition @ The Albuquerque Museum: You can probably recognize a Tiffany lamp when you see one. And you may have thought that Louis Comfort Tiffany designed and built them all. And you'd be wrong, as Abq Jew learned during a recent visit to The Albuquerque Museum of Art and History. Louis Comfort Tiffany was one of the most recognized designers of his time in decorative arts, especially in stained glass. However, some lamps, windows and other decorative objects which were originally thought to be designed by Tiffany himself, are now recognized as designed and executed by a special group of women who worked for Tiffany at the turn of the 20th century. The “Tiffany Girls”, as they were called, worked for Louis Comfort Tiffany in the Women’s Glass Cutting Department of Tiffany Studios along with their department head, Ohio-born designer Clara Driscoll (1861-1944). Through August 21, you can see wondrous examples of the Tiffany Girls' work at an exclusive, special exhibition at The Albuquerque Museum - previously shown only at The New York Historical Society in 2007 - but nowhere else in the world. This ground-breaking exhibition explores the turn of the 20th century New York women who created many of Tiffany Studios' celebrated decorative objects. Included are approximately 70 Tiffany lamps, windows, mosaics, enamels and ceramics, as well as pages of newly discovered documents written by designer Clara Driscoll. Click here to watch a great video about the exhibition, produced by Gov TV. To truly understand what you're looking at, Abq Jew recommends that you take a docent-guided tour. But if you just can't make it - you can still buy the book!